Die innovativsten Musiker des fünften Kontinents. Repräsentativ für die uralte Kultur der Aborigines mit den Didjeridubläsern Hudson, Dargin, Doyle ebenso wie für die zeitgenössische Musik mit Perkussionist Michael Askill, dem Ensemble Synergy, der Folk-Jazz-Gruppe Coolangubra und Multiinstrumentalist James Ashley Franklin. Dazu die Spitzeninterpreten der Alten Musik Europas: Die Renaissance Players und Sinfonye. Long before Australia, host nation of the 2000 Olympic Games, begun to receive international attention, Celestial Harmonies and Black Sun Music made a cultural commitment to record a wide spectrum of Australian composers and performers. "Once infamous for its “White Australia Policy”, Australia today ought be famous as one of the world’s most actively multi–cultural nations. Educated citizens of Australia live in a proverbially remote place, but they are generally much more worldly than educated citizens of less “remote” places. And we make some wonderful, remarkably diverse music. Australia’s musical riches are only just being discovered by many people in the rest of the world (and by some Australians!). Celestial Harmonies is the one international label that’s known those riches for years, and has recorded and actively promoted fine Australian musicians. It’s remarkable that a single, relatively small company’s catalog could yield such a rich collection. That company was also brave enough to allow someone independent of it to compile this album." 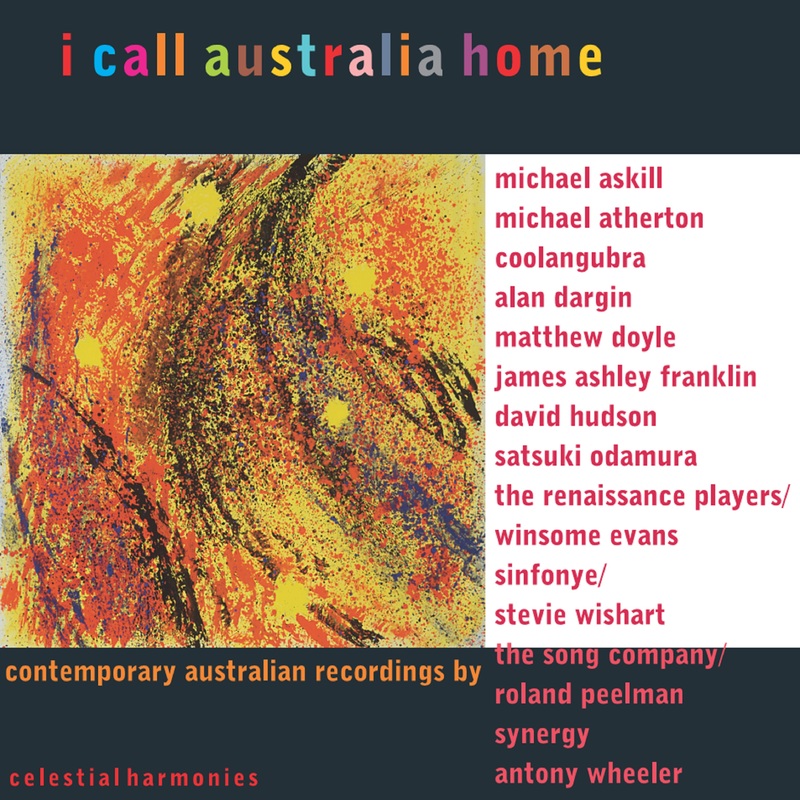 "I Call Australia Home is an eclectic collection from Australia's most innovative contemporary composers and performers. It brings together crosscultural visionary Michael Atherton and the Indigenous artists Matthew Doyle and Alan Dargin who have taken their didgeridoo performances across the world. Also included is the folk/world music fusion of Coolangubra, compositions by Michael Askill, the outstanding Sydney percussion ensemble Synergy and works by multiinstrumentalist James Ashley Franklin. Australia's foremost medievalists are also featured—early music scholar and performer Winsome Evans and her Renaissance Players along with Stevie Wishart and Sinfonye. Australia's foremost vocal ensemble The Song Company completes an extraordinary lineup of talent." This CD is a musical kaleidoscope capturing the originality and richness of contemporary musicmaking in Australia. I am delighted that through it, the work of our talented musicians will reach the world." 1 Virtuoso Didj - Alan Dargin & Michael Atherton from Cross-Hatch: Didjeridu + Percussion (15028) 1'35"
2 Cave Drawings - Matthew Doyle & Michael Atherton from Lyrebird (15023) 4'45"
3 Marimba Dances - Michael Askill from Australian Percussion (13085) 9'42"
4 The Hour of the Mouse - Synergy from Matsuri (13081) 5'06"
5 Dancing Vines - James Ashley Franklin from Butsuga (13177) 4'20"
6 Butterfly Dance - Coolangubra from Spirit Talk (13122) 5'26"
7 Setting of the White Moon - James Franklin & Antony Wheeler from Moon Road to Dawn (13180) 2'47"
8 Los Guisados De La Berenjena - The Renaissance Players from The Sephardic Experience Vol. 4 (13169) 5'32"
9 Kenjo (Dedication) - Synergy from Taiko (15021) 6'21"
10 Extract From the Great Hymn to Aten - Michael Atherton from Ankh: The Sound of Ancient Egypt (13174) 5'01"
11 Looking South - Lee, Atherton & Askill from Shoalhaven Rise (15019) 7'58"
12 Woolunda - David Hudson from Woolunda (13071) 6'40"
13 Psalm 100 composed by Heinrich Schütz from Der Schwanengesang (13139) 6'06"
14 Honey and Milk Beneath Her Tongue - Sinfonye from The Complete Hildegard von Bingen Vol. 1 (13127) 7'45"